The dC sign in the washing machine informs an owner about the problems with the door. Often, the error cause is not in the breakdown of devices. In fact, many owners use the appliance carelessly and inaccurate, especially when handling the door. In most Samsung washing machineы, dC error displays as De or Door. Some Samsung washers display a full word instead of fault codes. For example, “door error” or just “door”. 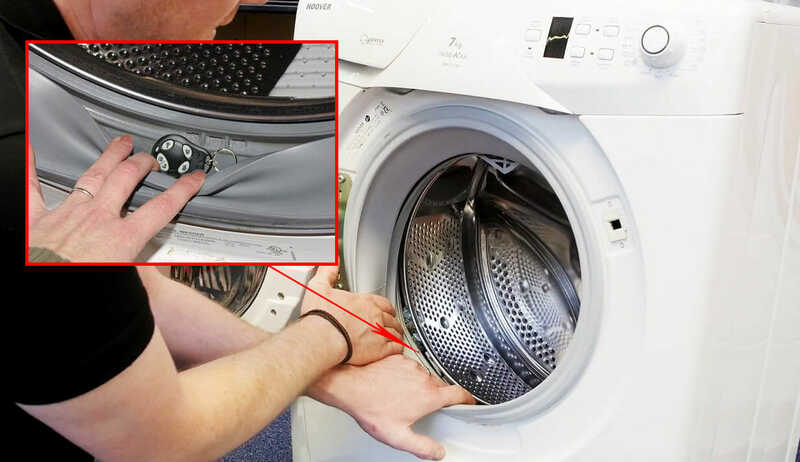 Washing machines without a display signal about fault by diodes flashing. Moreover, all the light-indicators of water temperature light up at the same time. the washing machine closes but the lock doesn’t work. Depending on the washing machine’s behavior, the problem can be both insignificant and difficult. The last one requires professional repair. If the Samsung device issues the dC error during washing, perform a simple diagnosis before calling a specialist. check the place between the hatch and the door for any obstruction. The point is that a foreign object may get stuck there and block the washing machine. In both cases, the answer is to remove the locking element and close the hatch tightly. If there is no solution, check for more complex causes of the problem. In Samsung washing machines, error “dC” on the display can report the electronic unit problems. Try to force the device to reboot, turning it off for a few minutes from the outlet. If this method also doesn’t help to remove the error, the problem is in the mechanism for locking the door. The table will help you to understand the meaning of the “Door” fault. Also, use it to find out how to fix the problem related to the Samsung technique. The hatch is not blocked. The dC code or its analog appears on the Samsung technology display. After washing, you can not open the door. Problems with the mechanism of the hatch. You have to install a new electronic lock. Also, ask a specialist for help. The dC error appears during the washing process start. Failure in the microchip function. This element regulates the work of the device – the indicating module. Only the master will determine the meaning of the mistake. Often it is enough to repair the unit and solder the resistors. If the processor has burnt out or the module is irreparably damaged, replace this part. The hatch doesn’t close because the hole in the body does not match the lock. The door of the Samsung washing machines is worn out or mechanically damaged. It is necessary to change the door (sometimes replacing the loops is enough). When you close the door, there is no click. So, the user can’t slam the door. The problem with the main lock. The part needs repair or replacement. The error reset occurs, but after a while, the Samsung unit lights up the dC indicator again. The wiring between the lock and the electronic module is damaged or worn out. Replace the plume or current conductivity (twisting wires) restoring will fix the situation. You can correct minor problems in Samsung devices work yourself. The complex electronics repair requires the help of a specialist.